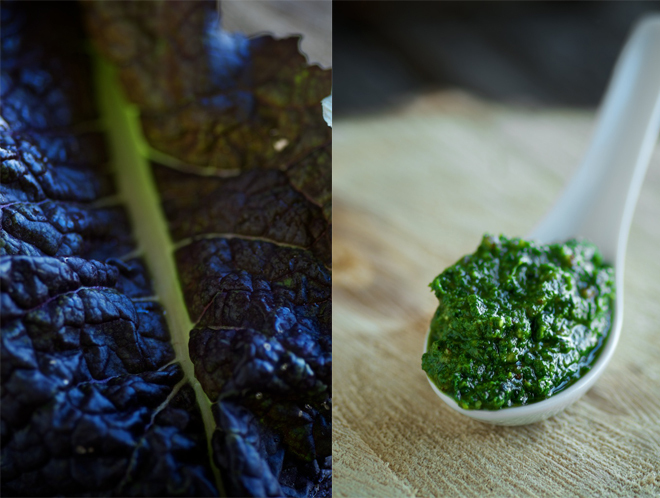 Mustard green pesto – spicy, hot and deeply refreshing – quickly eclipsed basil pesto this autumn as my favorite style. I love that its heat is potent, quick and sharp much like horseradish. It doesn’t linger. It’s simple to prepare, coming together in minutes in a food processor and it stores for up to a month, capped by olive oil, in the refrigerator. I serve it slathered over bread, tossed with cherry tomatoes in a fresh vegetable salad, or over roasted root vegetables. Mustard greens is a crucifer like kale or broccoli, and the greens are a powerful source of antioxidants including quercetin, and beta carotene. For this reason, mustard greens are thought to support cardiovascular health while mitigating the effects of inflammatory conditions in the body. The greens are also an excellent source of vitamin C, vitamin K and folate. The addition of olive oil and nuts to the greens help to make their antioxidants and vitamins more easily absorbed. Indeed, there’s some evidence that the consumption of dark, leafy greens like mustard greens helps to support skin health (and also reduce signs of aging) when they’re paired with saturated and monounsaturated fats – as they are in this recipe which requires 1 1/2 cups of extra virgin olive oil. Keep in mind that mustard greens are also a source of oxalates and of goitrogens; that is, in susceptible people oxalates may contribute to joint pain or kidney stones. Goitrogenic foods, like mustard greens and other crucifers, may slow down the thyroid function slightly and so it’s best not to consume them raw in excess and to always consume a diet that is otherwise rich in iodine which supports thyroid function. Soaking nuts and seeds, as called for in this recipe for mustard green pesto, may strike those of you unfamiliar with the dietary principles behind traditional foods as odd or unnecessary. Soaking nuts and seeds in warm water overnight helps to mitigate the effects of enzyme inhibitors that make nuts difficult to digest. Soaking nuts and seeds also lends a delightful creaminess to the pesto which makes up for the absence of cheese. Sprouting, which incorporates an initial soak and then the gentle, mindful germination of nuts and seeds, is also effective at mitigating the effects of antinutrients like enzyme inhibitors and others. I don’t typically sprout my nuts and seeds, but you can find sprouted nuts and seeds online (see sources) and it in some health food stores. The real key to making this pesto, as with any other pesto, is very good quality olive oil in addition to very fresh mustard greens and garlic. Olive oil is an extraordinary fat – rich in vitamin E, monounsaturated fatty acids, and polyphenols which are strongly anti-inflammatory and help to support skin health. Unfortunately, olive oil is one of the most adulterated foods on the market. Quite often, olive oil is diluted with GMO corn oil, canola oil, and soybean oil, before being repackaged and sent to your grocery store. As a result, those with food sensitivities and allergies are at risk; further, the cheaper oils are also significantly less healthy over all, are often extracted using a chemical process that renders their fragile fats unstable, and they lack the array of phytonutrients in olive oil. For this reason, it’s important to purchase olive oil producer-direct which reduces (if not eliminates) the likelihood of adulteration by unscrupulous middlemen. It’s difficult to find producer-direct olive oil, unless you live in an olive-producing area like California or Texas, locally; however, you can buy olive oil online straight from producers. Brilliantly green, this mustard green pesto packs a bit of a kick. It pairs beautifully with roasted potatoes, tomato salads and sourdough breads. Choose a good quality, extra virgin olive oil (I use this one), that's rich in antioxidants which can add to the complexity of flavors achieved in this spicy pesto. Toss pecans, pumpkin seeds and sunflower seeds into a bowl, and cover them by 2 inches with warm water. Allow them to soak for 4 to 6 hours, drain and rinse well. If you're in a bind, you can substitute sprouted or roasted nuts and seeds. Place soaked pecans, pumpkin and sunflower seeds and garlic into your food processor. Pulse 3 to 4 times until just combined. Toss in mustard greens and sea salt and pulse for a few seconds. Turn the food processor on and slowly drizzle olive oil into the seeds and greens until it forms a smooth and uniform paste. Serve immediately or transfer to mason jars, cap with additional olive oil and refrigerate for up to a month. I am used soaking my nuts and seeds but I love that in this recipe, you don’t have to put them through the dehydrator before using! That makes it a lot quicker. Thanks! I do this same thing but with chard from the garden. It’s a great way to use up that yummy leafy green when it’s in abundance. Sometimes I use it raw, other times I very quickly blanch the chard. The raw chard pesto comes out spicier. Look forward to trying this with mustard! Never thought of using spicy mustard greens this way! I typically make Indian Saag with a mix of mustard greens and spinach. I can see this combo working well for this pesto recipe too. healthy pesto i was wondering if i can replace pecan with almonds? My hubby will love this recipe! I have to make this asap! This is my first time visiting your site. It looks great. You have done a nice job. Trying to change the way I eat to less processed foods and eating more whole foods. Keep up the good work. Fantastic recipe! Although I also added the juice of 1 1/2 lemons, as pesto just isn’t pesto without it in my opinion. I love the grassy/spicy taste of the mustard in combination with the soaked nuts and seeds – it really doesn’t need cheese at all, although I was a bit sceptical when I first read the recipe. Thanks for sharing – I wasn’t sure how to use up all my mustard greens from the garden! We have a ton of big, gorgeous red leafed mustard. It is like eating horseradish 🙂 so the kids have not been helping. This recipe is a great way to use it. I am with Sezzy and added lemon juice. My first experiment with the recipe has been Mustard Pesto Hummus. It is a definite win! The chickpeas balance out the mustard beautifully. My nearly 5 year old daughter sat and ate green hummus with me for lunch today. Ooh, this sounds really good. I never would have thought of making a pesto with mustard greens. Admittedly, they’re usually a bit strong for me, but this sounds like the perfect use for them! Thanks!